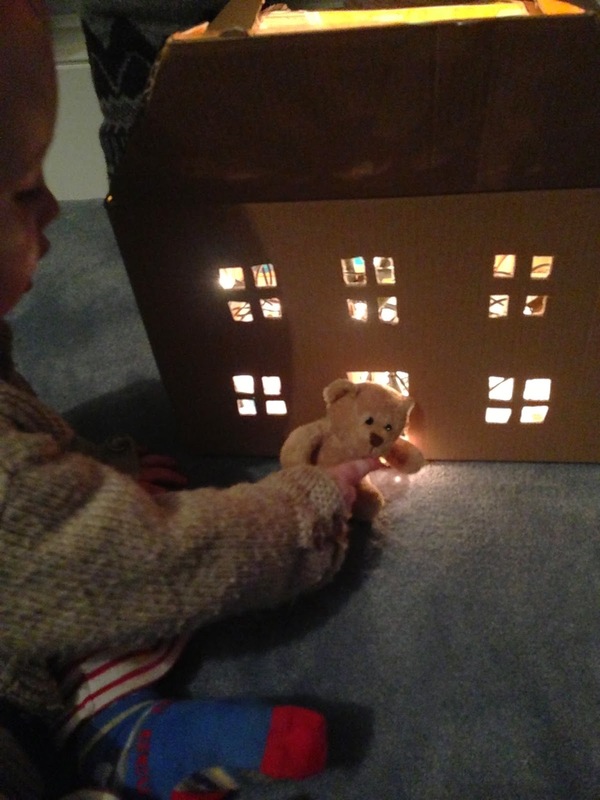 Birdie and Bear: Follow the light- non messy making project for kids. Follow the light- non messy making project for kids. 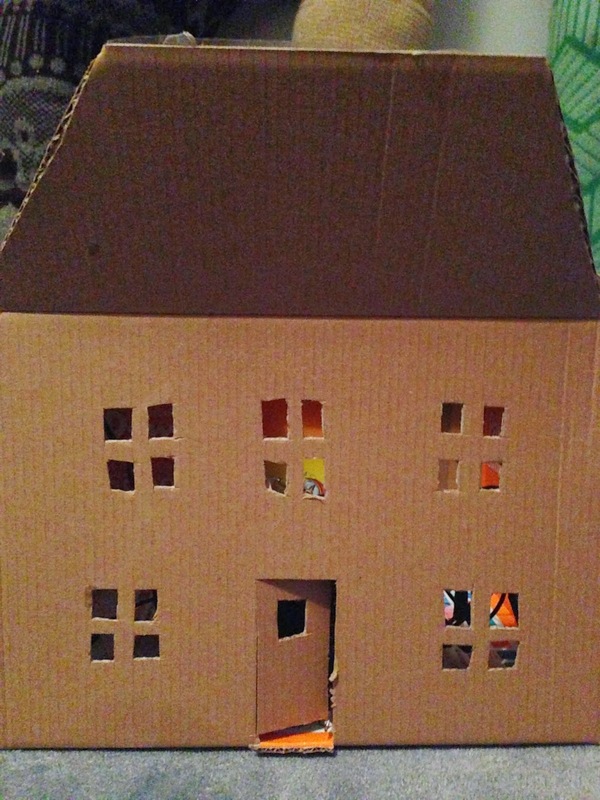 Cardboard box house with lights inside! 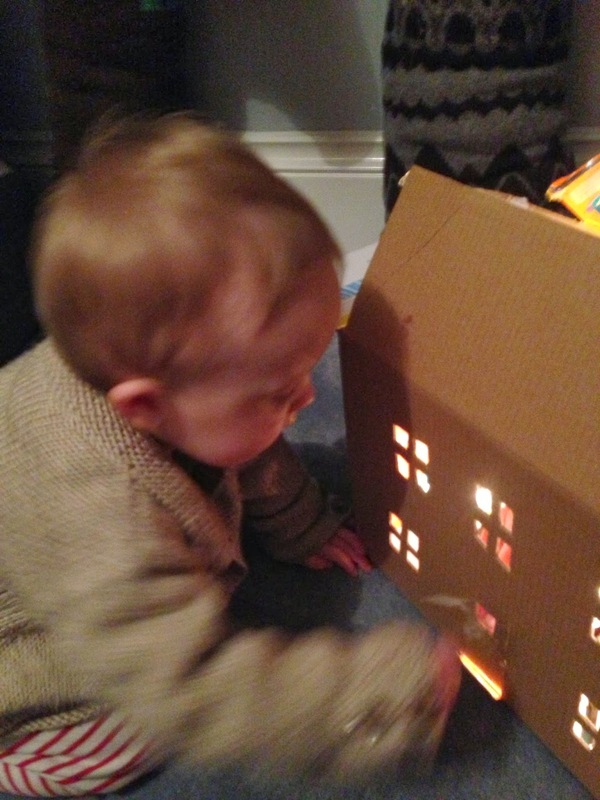 Eli is just over 1 now and LOVES lights and shadows , so once you have made this, switch off the main light in the room do the windows and doors really glow! You can make it any size- especially to fit any little toys you might have. This is is made from a pampers box turned inside out. you can make it as decorative or as simple as you want, but the more little windows ot holes you make in the box the better the light show! Step 1: Find a box- can be a show box or a huge grocery box. if it has a lot of pattern, cut down the join and rejoin in inside out so you have a plan clean surface on the outside. Step 2: Get a sharp craft knife- I wouldn't recommend cutting with a knife while your little one is around, and it's nice to surprise them once you have done this bit. cut out little squares for window - you can mark out with pencil first. Step 3: cut the door- remembering only to cut 3 sides leaving one edge as the hinge- you might want to score this lightly with your knife so it folds in the right place. Step 4. get some Christmas tree lights and put them in the box... it's that easy! don't leave this unattended when switched on. Tip: I leave the top open as Eli wants to take the lights in and out.